The Parti Wall project combines nine squares, created by teams of Syracuse Architecture faculty and students. 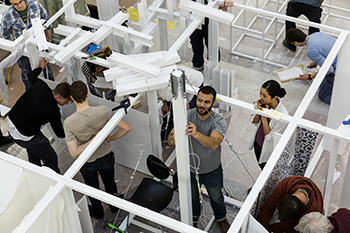 Over the course of the weekend of April 4-6, teams of Syracuse Architecture students, led by faculty members, worked together to develop a performative installation within a nine-square space frame in the atrium of Slocum Hall. “Parti Wall,” conceived and implemented by Assistant Professor Jonathan Louie, is a design problem and formal device for engaging mentors and students to co-develop form-based design strategies, resulting in 24 hybridized walls. The nine faculty mentors worked with their student teams to negotiate the boundaries that defined their respective spaces while working with the neighboring teams on co-construction of the walls that they shared. Stemming from the French term Prendre Parti, meaning “to make a decision,” the Parti is considered to be the chief organizing thought behind an architect’s design. Over the course of the 72 hours, the architectural sensibilities of the nine mentor-led teams emerged, demonstrating the versatility that the nine-square problem previously offered as an abstract spatial problem, a project on tectonics and an indexing of form, and, with this project, as an infrastructure for an event. Students and faculty work to create their distinct spaces in the Parti Wall project in the Slocum Hall Atrium. The overlap between projects created a mash-up of design agendas that merged the unique thoughts featured in the individual cells. Each cell featured a distinct individual project featuring a wide range of media and materials, including videos projected onto eight screens to distinguish between legal/illegal surveillance imaging technologies in privacy law; projections on each wall—drawing video, and modeling—based on the Wall Houses by John Hejduk; the domestic interior of the suburban home and its reflection through the grammatical interaction of surface, object and space, using the repetition of block printed William Morris Wallpaper, a symbol of arts and crafts era domesticity; and a custom set of notched foam-core I-beams that when interlocked together, merge into a cloud of linear forms that grow out of the cell, a formal nod to the Mie-sian corner. 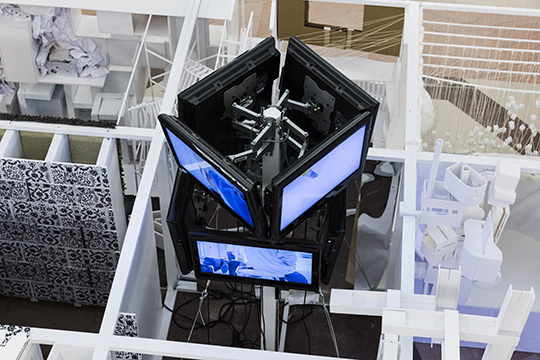 The installation will be on view in the Slocum Hall first floor atrium through April 23. A closing discussion with team mentors on the ideas and intent behind their approaches will take place in the Slocum Hall second floor conference room on April 23 from 5-6:30 p.m.
Parti Wall from Jonathan Louie on Vimeo.